The invitation to write a book of “lost stories from the history of science” sent me off to quiz scientist friends and delve into obscure archives accumulated over twenty-one centuries. The result is a book of ten tales that you and I didn’t hear in school science classes. Here are irrepressible risk-takers, spies, scoundrels, unsung heroes, tragic victims: Seventeenth-century Flemish Jesuit astronomer Ferdinand Verbiest invented the first automobile as a clever toy to amuse the emperor of China but was forced to test his knowledge of astronomy in a spectacular trial-to-the-death in the Imperial Court in Beijing. Intrepid eighteenth-century Frenchman Jean-Baptiste Chappe d’Auteroche trekked through dangerous and almost impenetrable regions of two continents to observe transits of Venus and gave his life for his science. Austrian physicist Lise Meitner’s hair-raising escape from Nazi Germany had the scientific world holding its breath, but she was unjustly passed over for the 1944 Nobel Prize in Chemistry that was awarded to her colleague Otto Hahn for splitting the atom. Benjamin Thompson, whose inventiveness and charisma rivaled Benjamin Franklin’s, spied for the other side in the American Revolution. There are chapters titled “Near Fatal Fiction” and “The Pavlov of Cats” . . . and more. Join me . 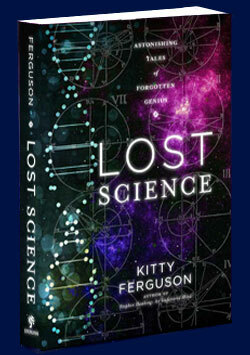 . . history buffs, science buffs, anyone who loves a good story . . . to discover these extraordinary people and their spellbinding, near-forgotten exploits.